The average Canadian consumes 110g of sugars daily. This is equivalent to 26 teaspoons, 440 calories or 21.4% of the average daily caloric intake. Of this 110g, 12.5-14.4% came from breads and grains, 25.7-33.2% came from vegetables and fruits, 15.5-17.8% came from dairy products, 33.6-44.2% came from "other," for Canadian adults aged 19-50. This "other" category are the added sugars we take in through commonly eaten pre-packaged, baked goods, and restaurant foods, such as sauces, condiments, granola bars, fruit juices, sodas, flavoured yogurts, chocolate milk, etc. Why are fruit and dairy sources exempt from the "added sugars" category? While fructose and lactose are sugars, foods that contain these sugars are nutrient dense. The nutritional components (fibre from fruit and protein from milk) slow the insulin response produced in the body, so blood sugar does not spike as drastically as with added sugars in low nutrient density foods. How do "natural sweeteners" compare? The antioxidant content of each of these sugars varied, with maple syrup and honey classified as intermediate amounts, and agave classified as low in antioxidants (see abstract). 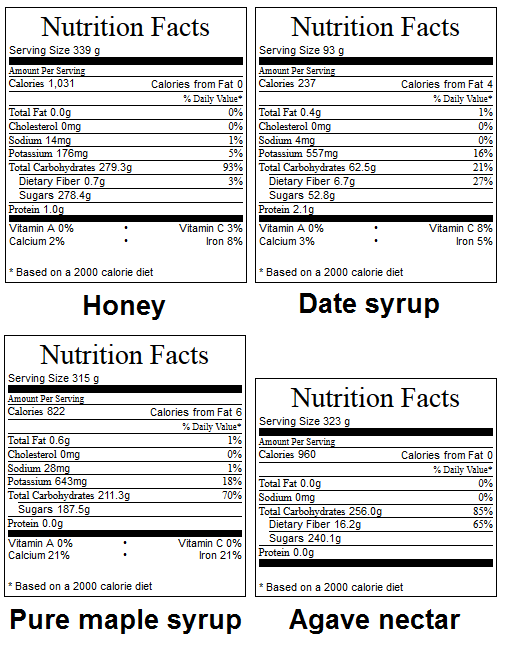 Antioxidant comparison for date syrup was not available. In conclusion, date syrup was the best choice for baking or adding sweetener to foods, as it is truly no added sugar, and is high in fibre and low in calories. The downside to date syrup is that it has a short shelf life and must be refrigerated. As for longer shelf life syrups, pure maple syrup ranked highest for nutrient density (high in potassium, iron and calcium, lower in calories).